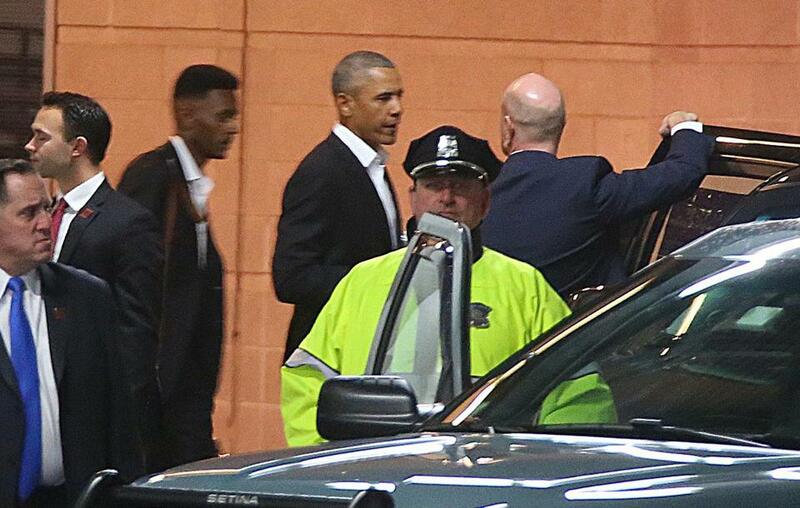 Former president Barack Obama left the the Boston Convention and Exhibition Center on Friday. The former president appeared at a sports analytics conference hosted by the Massachusetts Institute of Technology Friday. But if you were not an attendee at the event, don’t expect to hear much about what Barack Obama shared. Officials managing the 12th annual MIT Sloan Sports Analytics Conference at the Boston Convention and Exhibition Center put strict rules in place that extended beyond barring the media from divulging Obama’s insights. An e-mail sent to those heading to the venue for the “conversation with Obama” read like a line from the movie “Fight Club”: The first rule of seeing the former commander-in-chief is don’t talk about seeing the former commander-in-chief. During Obama’s panel, photography; video recording; streaming; and social media posting, including on Twitter, Facebook, Instagram, Snapchat, and other platforms will not be permitted — “without exception,” the warning spelled out. The regulations went for after the event, too. After the Globe inquired about the rules, a second e-mail said “sharing or reporting of its contents” is strictly forbidden. “This policy applies to all attendees, credentialed media included,” the second correspondence said. A conference organizer described the statement as “self-explanatory” when asked by a Globe sports reporter who is attending events at the conference this weekend. Obama “will discuss his time in office and the next chapter of his life” while here, according to a conference newsletter that came out when the announcement about the former president’s panel was made last month. This year’s conference has more than 3,500 people from more than 35 countries representing some 600 organizations and 200 universities, conference co-chair Jessica Gelman said Friday during opening remarks. Other speakers featured at the conference include former New England Patriots player Tedy Bruschi; Boston Red Sox executive vice president and CFO Tim Zue; Celtics co-owner Steve Pagliuca; ESPN host Katie Nolan; and former New York Yankees star Alex Rodriguez. Alex Speier of the Globe staff and Globe correspondent Jacob Carozza contributed to this report.